Born in Clifton, Ohio. Graduate of Denison University. Served in U.S. Navy as Lt. Commander during World War II. 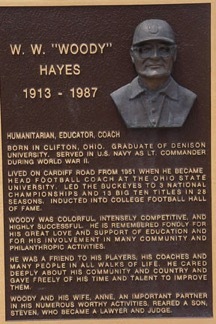 Lived on Cardiff Road from 1951 when he became head football coach at the Ohio State University. Led the Buckeyes to 3 National Championships and 13 Big Ten Titles in 28 seasons. Inducted into College Football Hall of Fame. Woody was colorful, intensely competitive, and highly successful. He is remembered fondly for his great love and support of education and for his involvement in many community and philanthropic activities. He was a friend to his players, his coaches and many people in all walks of life. He cared deeply about his community and country and gave freely of his time and talent to improve them. Woody and his wife, Anne, an important partner in his numerous worthy activities, reared a son, Steven, who became a lawyer and judge.